I read an article a couple of weeks ago about a group of women who are mums and have founded a group called Cycling Mums Australia to encourage mums around the country to return to riding. So I looked them up via Facebook and talked via email with one of the group’s founders Natalia de Clercq. Over to Natalia…. Q: Why did you start the group Cycling Mums Australia (CMA)? Well, what happened when I became a mum, my priorities changed, we have so many competing priorities that the bike got pushed down the list, ignored , forgotten about. I used to ride five mornings a week , early golden light – with bunches of men – old ones that told great stories. When my friend and I went back to riding , the lycra was a fair bit tighter, less comfy and the boys bunch didn’t get why I had to return to feed my son, or why we didn’t show up for the morning rides. We often have mums arrange to join the bunch but inevitably someone has been up all night with a sick child or needed to cancel, and the group just gets it! We started mum cycling groups talking about the day, hardships, which had a huge effect on post-natal state of mind and got us into the fresh air feeling so free. Here we are today, cycling turned into friendships, a network, a support group of amazing group of women. Women balancing family life, children, single parenting. We have members who aren’t yet mums, one day want to be mums, know a mum, are a mum, or grandmother. Our Mission is to inspire, encourage and empower women and provide a healthier place for them and their children and families. It also provides a healthy catch up where you can talk and see friends whilst pushing the pedals. Cycling for many of us is our freedom, the pathway to our inner child and if we hadn’t started cycling, the women we have in our lives wouldn’t exist. Cycling Mums was the obvious choice or niche within my passion. Most of the women I was out riding with at 5.45 am each morning are mums, and we are all trying to get the time out on the bike while juggling being mums. Q: What sort of cyclists do you target with your group? We have a selection of social riders, road fans, track loving, cross bike loving and mountain bike mums . We encourage mums to just get back on the bike – hybrids or anything that they feel comfortable with again. We’ve had some cycling workshops on mastering descents, cornering, etiquette, etc. and next year will be adding mountain bikes and cross bike rides to our monthly rides. We also partner up with accredited cycling coaches and clinics in the area who host indoor rides on the computer trainers for those mums still hesitant to venture out on the road, or those who are coming back from injury or lacking confidence. One coaching clinic has a crèche that the kids can utilise so it suits the times and routine of the busy mums. Computer training is great as it measures watts , power and for the advanced cyclists amongst the groups can do an FTP test or challenge themselves on an individual al ride program. Q: How many chapters/members do you have? This is our second year for CMA and we now have ambassadors in every state around Australia who lead group rides or support the local community where they live – 25 in total. This year we had a lot of interest from Europe and America as well. Q: Do you allow other women who aren’t mums join in the fun? Off course! We have loads of members who are single girls who tell us they like the safety of cycling with a group of mums. Some members live overseas or interstate and they see us as a second support. We are very inclusive. Our jerseys also highlight this and we are trying to promote the message of safer cycling between road users! We always get a shout or a good “On ya mum” wearing our jersey and it makes people sit up and relate – hey this cyclist is a person, a dad, a mum, a wife, someone’s child. Q: Do you see Cycling Mums evolving in to a cycling club? We aren’t a typical club that has a the mid-week bunchie, the friends you know only by their first name that leaves you with that post-ride high as you roll back home. 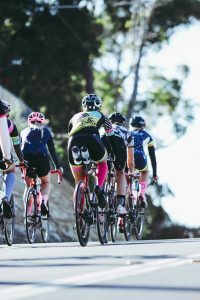 Our group is different: our bunch is generally entirely women, and it is a different time of day and we are part of a new wave of riders – one for whom a sense of community is just as important as numbers and watts. 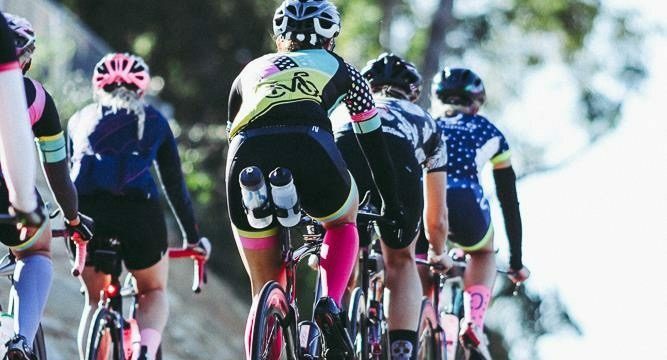 Most of the women ride for fun, value the camaraderie of their fellow cyclists, the support and encouragement of the bunch, and the friendships forged on the bike. They love a physical challenge, sure, but not one where there’s a winner and a loser. They live for the post ride banter and brews. Q: Tell us about your Town Down Under tour in 2018? We plan to hold a few cycle Break away tours over the next few years and also planning to have our own cycling events . But our inaugural cycling tour will be in Adelaide from 18 to 21 January 2018. It is a female-focused ride program, with a highly skilled and passionate ride guide to assist with on ground experience. We may also get access to the pro woman’s peloton! Each day CMA has the opportunity to ride the challenging stages on offer, so a good level of fitness is recommended. Optional rest days or shorter rides can also be offered for those who want to take it a bit easier. All riders will have a mechanical support vehicle and riding guide team throughout the tour. For more information about the tour check out the CMA website. What are your thoughts about Cycling Mums Australia? Share your experiences via Comments or the Women Who Cycle Facebook page. Our Angus Ladies Leisurely Cycling group is similar in many respects- it’s a social group encouraging ladies to cycle in a safe and fun environment. Ladies of all ages join us on locally based rides- often startling as new to cycling or returning after many years off a bike. It’s non competitive and we ride at a leisurely pace, covering rides that vary on length so everyone can take part. 50+ years age difference between our youngest and oldest riders, proving age is no barrier. Our goal is happy, healthy ladies who feel confident cycling.